Sunday June 15th 2014 is Father’s Day in the United Kingdom. 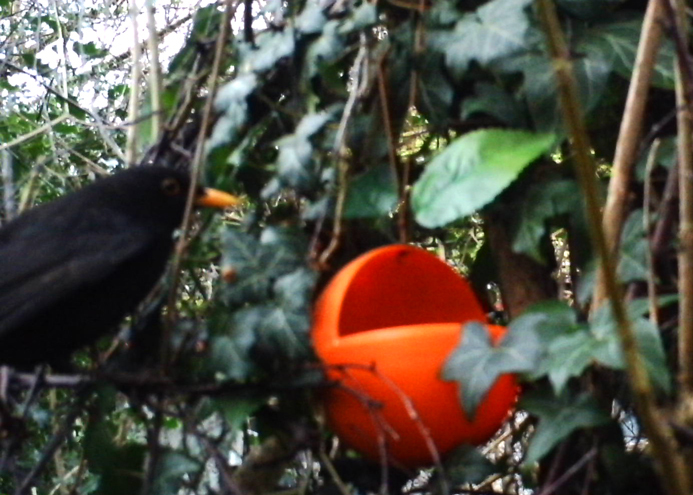 Male blackbirds make excellent fathers; great link eh? 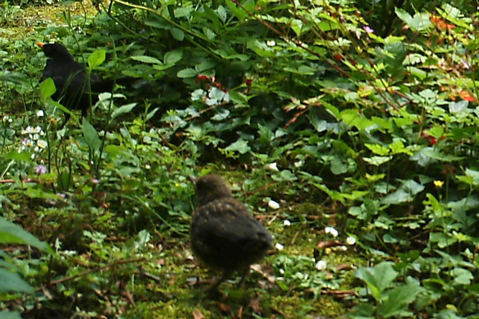 Here we see daddy blackbird showing his young fledgling the best places in the garden to scratch around for tasty insects. He will also teach his young charge to wait outside the back door impatiently for some sultanas. The Eurasian blackbird, Turdus murula is actually a member of the thrush family. The males have black plumage with a striking yellow beak and eye ring, whereas the females and youngsters are brown splodgy things. 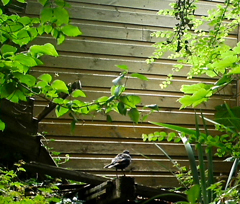 They are a very common and vocal garden bird. The blackbird is the national bird of Sweden. Up until the eighteenth century they were also known as ouzels. Most of you will be familiar with the nursery rhyme in which some blackbirds form the filling of a pie. It may sound like nonsense, but apparently during the sixteenth century, pies would be baked with song birds kept alive in them. Go on, you want to know how it is done don’t you? I will tell you if you promise not to inflict this upon any songbirds (or any other living thing for that matter). As an aside it is perhaps prescient that pastry pie crusts were known as coffins, being the medieval word for box or basket. We have to look to the 1598 English translation of Giovanne de Rosseli’s “Epulario” (The Italian Banquet): a large pie or coffin is baked filled with flour, a hole is cut in the bottom to release the flour and a smaller, edible pie is put inside it, live songbirds are then stuffed around the gaps. When the pie is served the top crust is removed releasing the song birds and then there is still a smaller pie inside that can be eaten. Presumably the noble folk of the sixteenth century royal court did not mind a bit of bird poop on their meal. Blackbirds have been shown to display unihemispheric sleep patterns, whereby one half of the brain sleeps while the other half remains alert to danger. 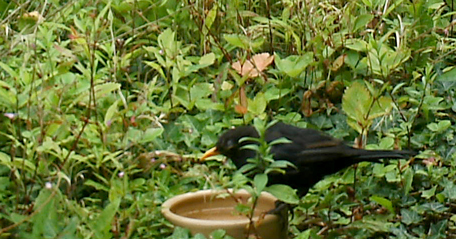 It seems to me that many inhabitants of the garden rely upon the blackbird’s alarm call to warn them of danger – mostly passing cats. Sonora Smart Dodd invented Father’s Day in the United States of America in 1910, having been raised with her five siblings by her Civil War veteran single father. However, it was not signed into law until 1972, by President Nixon. The date it is celebrated varies around the world based on religious or national significance. Russia celebrates the “Defender of the Fatherland Day” which could technically include women. Whereas, Catholic countries tend to celebrate on the Feast of St Joseph’s Day. So I salute you, devoted dads of the world, be you bird or man – Happy Father’s Day. This entry was tagged blackbird, Epulario, Father's Day, Live Birds in a Pie, Ouzel, Unihemispheric Sleep. Bookmark the permalink.